Early Check-in: Sunday, April 28 at noon. Conference: Monday, April 29 to Wednesday, May 1 from 9am to 5pm. Conference registration is now open. Participation is limited to only 700 attendees, so it is important to register early. Registrations can be done individually or by organization. For your convenience, organizations registering groups will be able to download a spreadsheet submit it us to be imported. More information will follow when registration opens. Online payment is available. For those who will be paying via Purchase Order, complete the registration and choose the pay by Purchase Order option. All payments must be received prior to the conference. Attendees will be able to earn 24 hours of CE credits. To qualify for these credits you must provide your department issued Law Enforcement ID number and the last 4 numbers of your Social Security number during the registration process. Everyone who attends must bring their public safety agency, city, county, state or federal department issued ID to show during the conference check-in before receiving access to the conference. 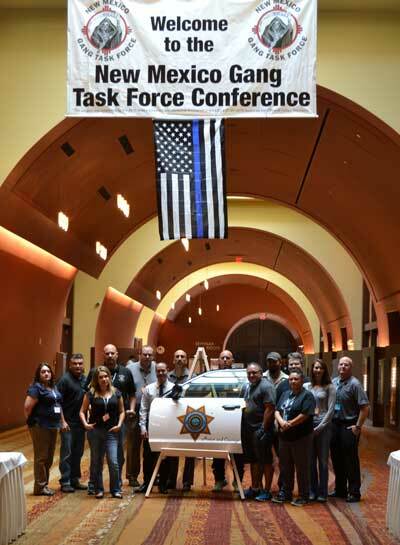 There are no exceptions and the New Mexico Gang Task Force reserves the right to refuse access to ineligible attendees. ​Attendance is limited to those who work directly for public safety agencies and city, county, state or federal departments. Identification is required. NMGTF reserves the right to refuse ineligible attendees. Agency Identification will be REQUIRED at the time of check in.